Tuesday morning 30th May, prior to saying goodbye to Erik and Tish. The Emma Radford Memorial Buell/EBR & Italian Motorcycle Festival (Em's Day) on the 29th May 2017 was a remarkable success. It was our 14th event held at the Lincolnshire Aviation Heritage Centre (LAHC) dedicated to the memory of Emma Jane Radford, Buell rider and UKBEG member, who passed away 22nd April 2004, aged 26. This event raises funds for the Papworth Hospital Cystic Fibrosis Unit that looked after Emma. Being able to have Erik Buell as our guest of honour was a real coup and, judging by the feedback since the event, he helped to make it a very special and memorable day for Buell/EBR enthusiasts. On the day, many people asked us how we’d managed to persuade Erik to come over to England for this event. We explained that since 2004 we’ve always let him know the date of the event when it’s been booked and left it at that. We were aware that he’s always wanted to attend but he’s always been too busy to make the trip. Imagine our surprise and delight when, on the 14th October 2016, he replied straight back to our email saying that he’d attend this year’s event. We had to look at the email a couple of times to make sure we weren’t misreading it. We weren’t, it was correct, dreams can and do come true…. Because most of Erik’s previous visits to Europe had been at very short notice or with no notice at all, to have so much time for planning was a real bonus. People could make travel plans, book accommodation and arrange time off work if required. We tried to publicise the event as best we could without a budget to cover paid adverts etc. 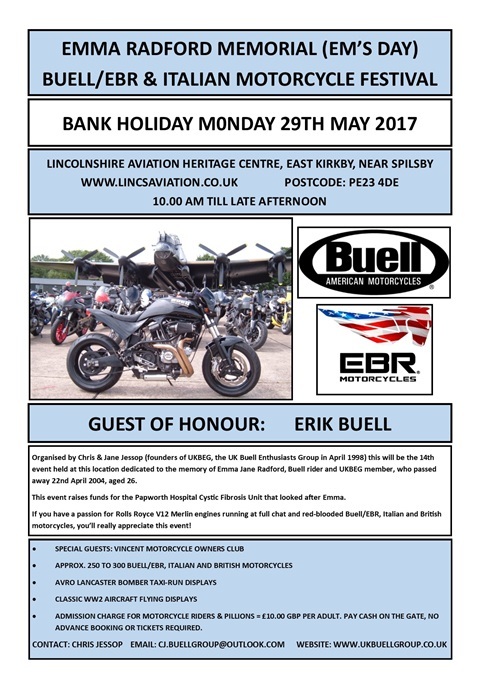 but all the mainstream motorcycle press seemed completely indifferent to the news that Erik Buell was to attend a Buell enthusiasts event in England. We must thank Kev Meanwell for his help with publicity for the event through social media and for his unstinting dedication to this and previous Em's Days. Jane and I simply couldn’t stage this event without his help. For this event, Jane and I have always stayed at the Red Lion, Revesby. It’s a small traditional country inn located just two miles from East Kirkby village. When we knew that Erik and Tish were going to attend we immediately booked all their three available rooms. As they were coming all the way from Wisconsin the very least we could do was to cover their accommodation costs for the weekend. The spare third room was held in reserve just in case any of Erik’s colleagues from EBR USA also wished to attend. As things worked out we used the spare room for our good friends Karen and Shabana who would be helping us out on the UKBEG stand with merchandise sales etc. In December 2016, we were given permission to use the Erik Buell Racing (EBR) logo on T-shirts to commemorate the event. Using this logo, we came up with a clean uncomplicated design that (for us) nicely summed up the event. This was to be offered in a white or grey shirt. Following the announcement of this design a few people on the ukbeg.com forum suggested we amend it to include more detail, such as website address and the fact that it was a UKBEG event. We didn’t want to change it so we asked people to come up with an alternative. Nobody came up with a design so we produced a black shirt based around the Buell logo. Offering two designs worked very well and sales of each type were 50/50. The shirts would only be available at the event. We didn’t want the hassle of selling them via mail order so we introduced a preorder scheme for collection and payment on the day. We also had some indoor banners* made for the event using the EBR logo. All this work was done over the Christmas and early January period when, from the outside, everything looked promising for the future of Erik Buell Racing. They had recently announced the new 1190 Black Lightning model and Erik attended the main US motorcycle shows in December and January to promote it. * These were never used and sold after the event to raise additional funds for Emma’s Charity. On the 27th January 2017 Liquid Asset Partners, the owners of EBR, issued a press release stating that they were to cease production of all motorcycles due to difficult trading conditions and eventually put EBR into liquidation* if a new buyer couldn’t be found. This announcement came just a few days before we had a planning meeting arranged at LAHC to discuss this year’s event. We thought the news from the USA would mean that Erik couldn’t make the trip to England. We hesitated to contact him on the same day of the announcement about EBR but decided to send him an email. There was no point in having a planning meeting if it was just going to be a normal Em's Day. Erik replied by return, ‘I will keep my promise’……sighs of relief all round. *The liquidation process subsequently started on the 7th June. We have an excellent working relationship with the LAHC having been members of their ‘Supporters Association’ since the late 1990s. LAHC’s support for this year’s special event proved invaluable and we can’t thank them enough for giving us everything we asked for. Andrew Panton, grandson of one of the LAHC founders, deserves a special mention for all the help he’s given us over the years. 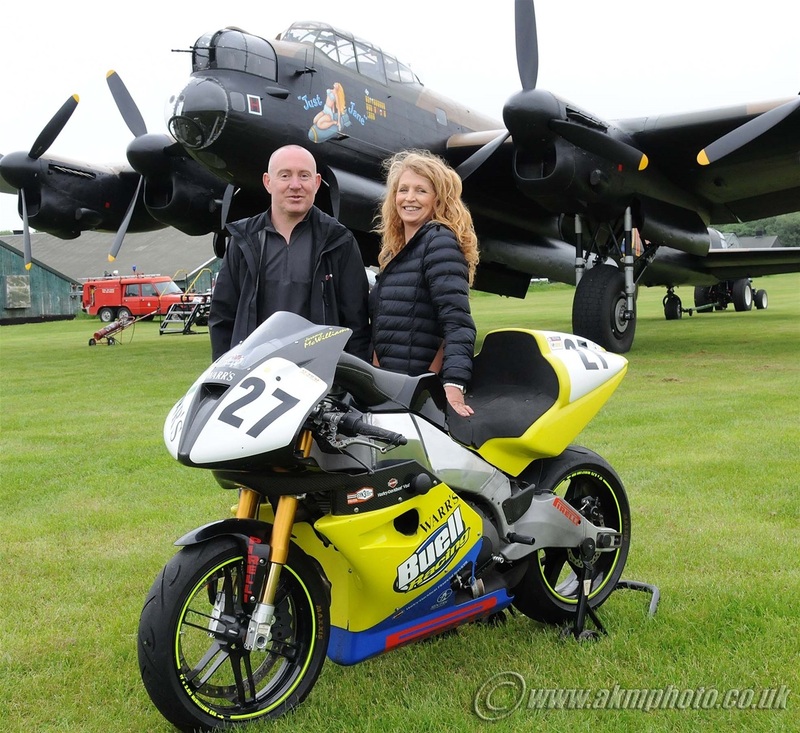 For this year’s special event, we could have a UKBEG stand and Buell/EBR motorcycle display in the main hanger. This was the first time we’ve done this for Em's Day and it was well received by all who attended the event. There were 17 motorcycles in the display, they represented most, if not all, of the Buell/EBR models that had been available in the UK. The display included a very rare Ronin (number 43 of 47 made) that had been privately imported from the USA. The Ronin is a limited-edition special based on the Buell 1125CR. A surprise addition to the display was a 1340cc Buell XBRR race bike which arrived early just as we were setting up the UKBEG stand and display. 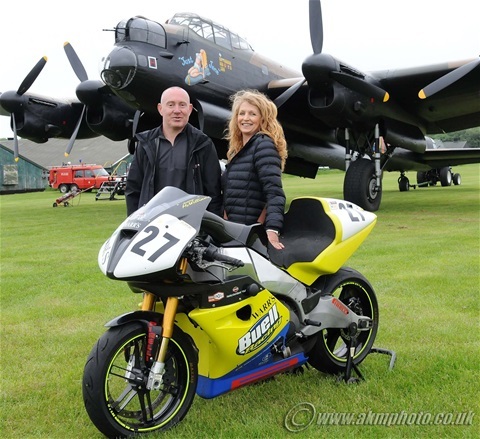 The XBRR was brought to the event by massive Buell enthusiasts Brian and Tracey. They bought it from John Warr of London's Warr’s Harley-Davidson dealership. It’s the actual bike ridden by former 250 GP and Moto GP star Jeremy McWilliams at the Daytona 200 races in March 2006. Brian and Tracey also own two road going Buells and it was a bit of a last-minute decision to bring the race bike in a van. After everything was set-up in the main hanger we awaited the arrival of our guest of honour. 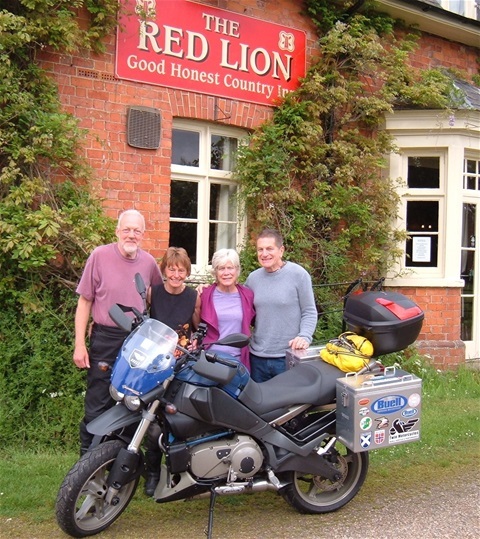 Karen and Shabana brought Erik and Tish from the Red Lion to the event at 10.00am. 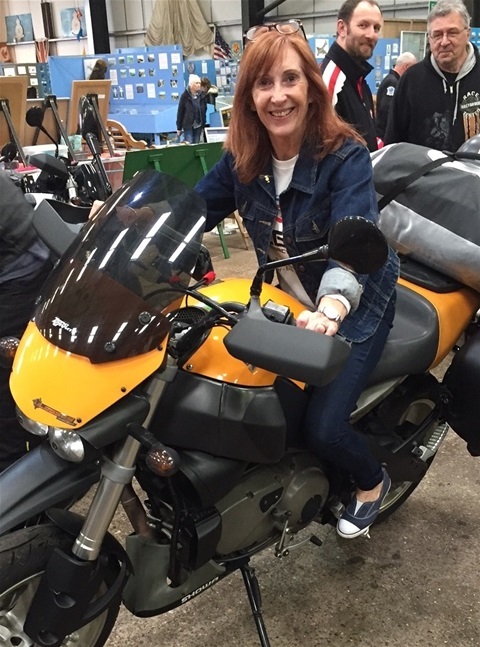 Jane and I were quite emotional when Karen’s car drove down to the motorcycle entrance, after all these years of hoping and dreaming here was Erik Buell, arriving at our main event. Before I took Erik and Tish into the Aviation Centre, Erik presented us with a personal cheque for $1000 (£780) for Emma’s Charity. Erik’s kindness and generosity made us even more emotional, what a start to the day! The weather forecast for the 29th May wasn’t exactly great, rain was expected over most of the UK. In the run-up to the event most of the country had enjoyed a week-long heatwave but it wasn’t to last. There was nothing we could do about it; the event was going ahead regardless. We knew a lot of people would still come on two-wheels because it was such a special day for Buell/EBR enthusiasts but we were worried that the rain would badly affect attendance. Luckily it stayed dry over East Kirkby for most of the day but almost everyone got wet riding to and from the event. Despite the poor weather we managed to break the record for the number of Buells/EBRs at Em's Day with 115. The previous record was 105 in 2008 when the Buell Motorcycle Company was still a going concern and we enjoyed pleasant weather. The unexpected arrival of the XBRR on the UKBEG display created so much interest that I decided to use this model for the professional photo shoot with Erik Buell later in the day. Brian and Tracey were over the moon with how things worked out. Not only did they get to meet their hero but their XBRR was the star of the show. Erik signed the seat unit and he even helped to push it about for the photo shoot. The look on Brian and Tracey’s faces was priceless, they couldn’t believe all this was happening. I think I made their day! The event went smoothly although we had to change a few things as the day went along to fit in with everything else that was taking place at the Aviation Centre. It was challenging work but great fun making sure the event was a success. Everyone had a wonderful time and as many will testify Erik and Tish are nice approachable people and so easy to get on with. During their time in the East Kirkby area they unselfishly spent time with everyone and gladly signed autographs etc. 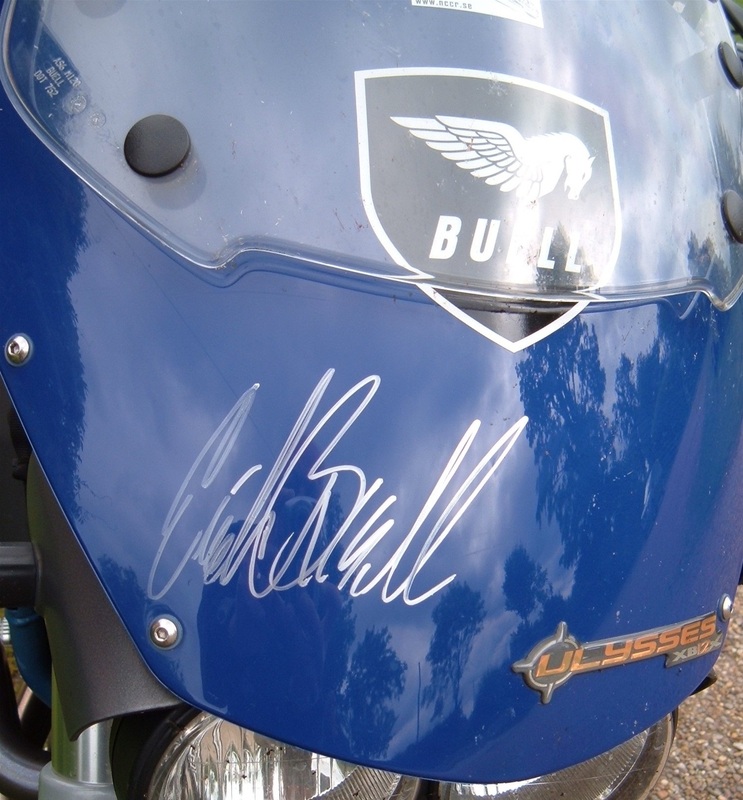 One thing we didn’t realise until later in day was that Erik had been asking people to donate to Emma’s Charity when he autographed motorcycles and memorabilia. 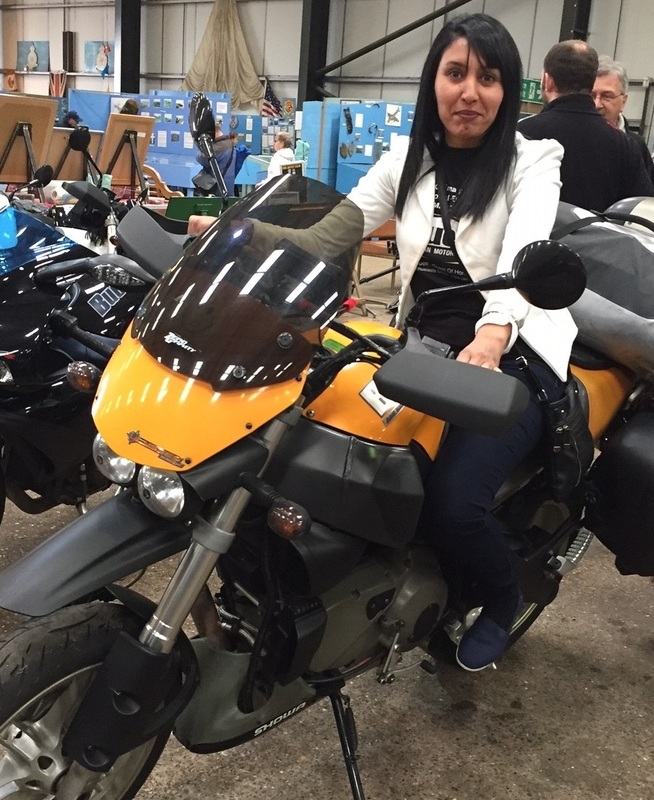 Our friends, Karen and Shabana, who were looking after T-shirt sales for us, kept a separate record of these extra donations and they amounted to £80. The amount raised at the event was £1,855.00. 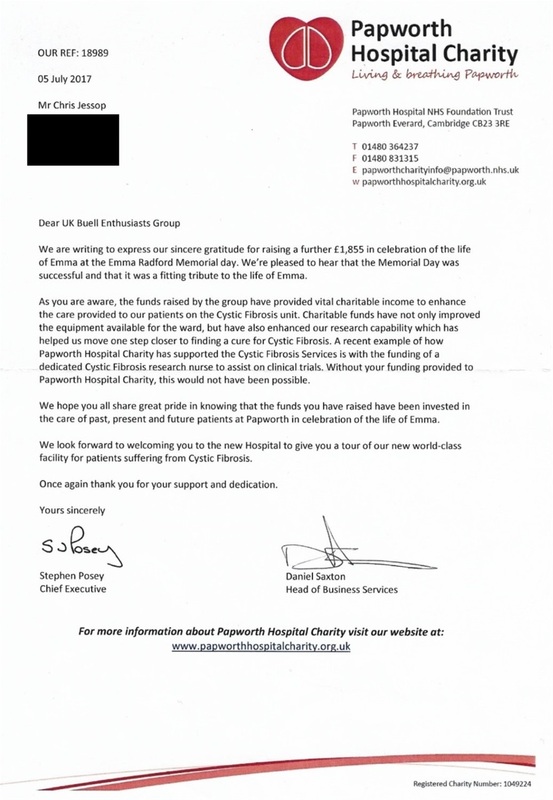 On the 1st June, we posted a cheque for this amount to the Papworth Hospital charity office. It was cashed on the 12th June. As of 2nd October, the amount raised for Emma’s Charity through Em's Day 2017 now stands at £2,200.00 + £25.00 Gift Aid.